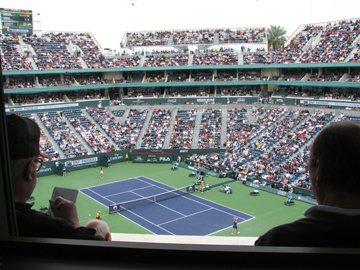 Just arrived at the BNP Paribas Open in the Southern California desert at Indian Wells. My rechargeable camera batteries won’t recharge so let me use my cellphone and my verbiage for an early morning tour of this very unique event. The organizers take good care of the players, the media, and the spectators. 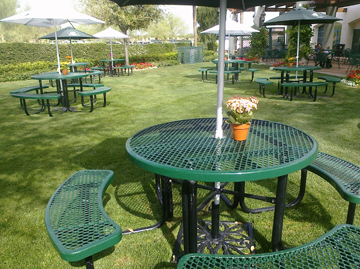 Not only does a local restaurant grill your choice of meat and vegetable on the patio outside the player/media restaurant, the sunny garden eating area has potted plants on its picnic tables. On the first practice court there’s a tall skinny player practicing crosscourt backhand slices ad infinitum. I’m pretty sure it’s Marin Cilic. If the athletic life looks glamorous from the outside, the grueling repetition is a good corrective for that image. 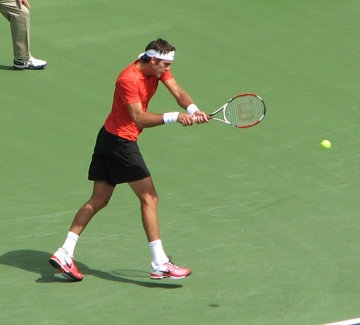 At the moment, two tall skinny players are left in the draw – Ivo Karlovic and Juan Martin Del Potro. Karlovic missed the last six months of 2010 after surgery on his Achilles heel. Del Potro is finally doing well in a high profile event after wrist surgery and effectively missing all of 2010. Injury, surgery, and rehab – more correctives to that glamour thing. On another practice court, Francesca Schiavone is foaming at the mouth and it’s still only 10am. No wonder she’s a champion. She grunts and struts along the baseline like it’s the finals and she’s already out of the tournament. A woman stands across the net from Schiavone and feeds her another ball before she barely finishes her service motion. 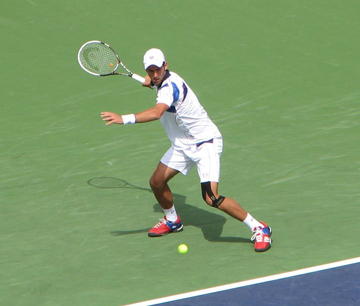 It’s a way of mimicking a hard hitting opponent by feeding balls from a short court. Schiavone is small but she’s got those muscular thighs you see on players like Dinara Safina and Kim Clijsters. I love the contrast between delicacy and muscularity in top athletes. Schiavone’s delicate wrist gently bounces the ball in preparation for her service motion. On the next shot, that same wrist snaps off a hard smack down the line. On the Stadium 2 court, Ivan Ljubicic squats on the side of the court next to his hitting partner who also squats. Ljubicic then runs around the court a few times while Ljubicic’s coach Riccardo Piatti warms up the hitting partner with soft looping balls. I’m looking around the courts to find out which player is grunting and groaning through their practice session when I realize I’m listening to Piatti. Even coaches grunt now. The Tennis Garden is covered with rows of green tents selling products geared to the tennis crowd. I stop in to talk to a guy selling memorabilia and, besides learning that there are such things as tennis trading cards, find out that business is markedly down this year. Probably an indication that that the continuing housing slump has settled into the psyche of the west coast. I myself have a house at the moment that’s upside down. At least that house is still standing. The people I’m staying with have the television tuned nonstop to coverage of nuclear reactor problems following the earthquake and Tsunami in Japan. Both of them are hard of hearing so they don’t bother with the audio and we sit watching one horrific image after another. The images sink in deeper than the words. In the main stadium, Victoria Azarenka and Carolyn Wozniacki walk onto the court for their 11am match carrying a Japanese flag. The stadium observes a moment of silence before the players start their warmup. Azarenka is down 0-2, 0-30, when she walks off the court. Ten minutes later the match resumes but only temporarily. Down 0-3, Azarenka walks off permanently with a hip injury. Wozniacki will now face either Maria Sharapova or Peng Shuai in the semifinals. Yes, Peng Shuai. Oh, and Del Potro just got bumped up to the semifinals free of charge after Tommy Robredo drops out with a strained adductor muscle. I’ll be back later today to cover more matches if anyone is still left standing. Stay tuned.